Ian Somerhalder and Nina Dobrev shared some insight about the female world—in two very different ways. The Vampire Diaries actors and real-life couple took to their Twitter accounts to share their feelings on what women have to go through living in today's world. "Whoa-reading insane news. Is it me or does it seem weird that middle-aged men are making womens' health care decisions? (sic)," Ian tweeted on August 30. "Ah! I hate tweezing! How is it that we've been able to cure polio, clone babies, we can re attach limbs but no one has figured out how to really truly kill a hair follicle forever?! Or regenerate them.. For those losing their hair (sic)," Nina tweeted yesterday. 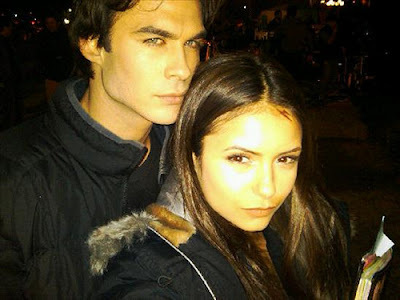 Ian Somerhalder and Nina Dobrev both care about worldly matters even if one hits closer to "home" than the other. Ian is in to politics by way of trying to make the world a better place. Nina, on the other hand, cares about that kind of stuff too, but she tends to tweet about things that bother her... and she's right—why do women have to constantly pluck, shave, and wax? !